Some of the top global development goals have been the reduction of carbon dioxide emissions and climate protection. Consequently, research and development schemes have been carried out nationally as well as internationally, with the goal of improving the CO2 footprint in different processes. Other than specifically energy-intensive industrial sectors, the building sector is one of the largest CO2-emmitters. Nearly 40% of the energy consumption in the EU is spent for the heating, cooling, air conditioning and lighting of buildings. Taking into account next-generation façade devices and smart windows, one feature of this challenge has been dealt with in the Large-Area Fluidic Windows (LaWin) research project; performed at the Friedrich Schiller University Jena, Germany, from 2015. The innovative kind of smart window has now been reported in the forthcoming issue of the Advanced Sustainable Systems journal. In the paper titled “Large-Area Smart Window with Tunable Shading and Solar-Thermal Harvesting Ability Based on Remote Switching of a Magneto-Active Liquid”, materials researchers from Jena introduce prototypes of a window that modifies its light permeability by just touching a button, and could be simultaneously used for solar-thermal energy harvesting (DOI: 10.1002/adsu.201700140). Our project’s key feature is the use of liquids in windows and façades, for example, as heat carriers or to enable additional functions. To this end we develop new glass materials, into which large-area channel structures are integrated. These are used for circulating functional fluids. In the latest prototypes, nanoscale magnetic iron particles are loaded into the liquid, which can be derived from the liquid by using a magnet. Conversely, if the magnet is switched off, they get re-suspended. The efficiency of the prototype with respect to heat gain per area is comparable to that of ultra-modern solar thermal facilities. However, in contrast to those facilities, the new system can be easily combined with a vertical façade. The shift between on and off, that is, the release or capture of particles, occurs in a separate tank. There is no need for an electrical connection at the windows. 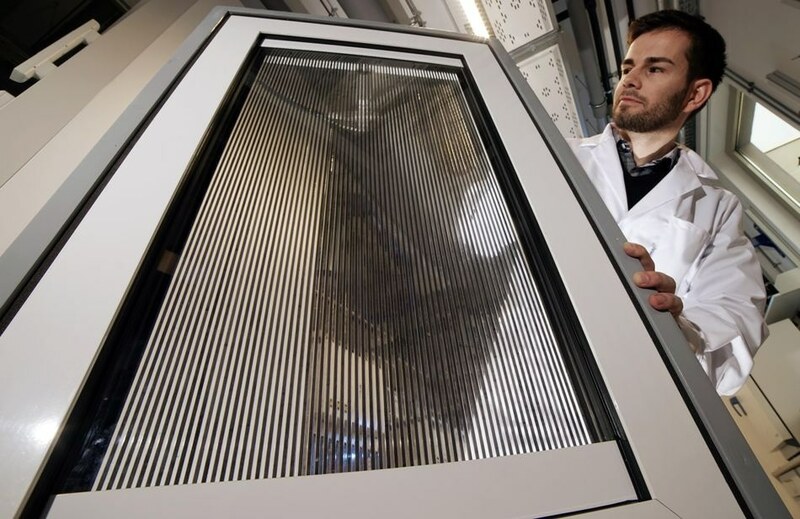 “The greatest advantage of large-scale fluidic windows is that they can substitute air conditioning systems, daylight regulation systems and for instance warm water processing,” reiterated Wondraczek, who holds the chair of Glass Chemistry at the University of Jena. It is important to develop cost-efficient large-size window glass modules. One thing is that the glass elements must incorporate the channels; the other thing is that they sustain their performance throughout the building’s lifespan. Eventually, they must be able to be combined with standard window manufacturing methods in frames of double or triple glazings. By using the latest prototypes produced on a scale of nearly 200 m2, the research consortium showed that those demands can be satisfied. From 2015 to 2017, a grant of 5.9 million Euros was awarded to the project from the European Union within the framework of the Horizon-2020-Program for Industrial Leadership. An additional 2.2 million Euro have been contributed by 11 industry partners who are members of the consortium. When the first funding period ends, commercialization of first applications is slated for this year.